Not a country folk like you! Life of the party. RPPC. Private Collection. Something uplifting now. Mr. Life of the Party is standing apart from his group, accessorized with a coat, top hat, cigar and cane. His buddies are laughing at his staged city boy cocky attitude (and I am too). Two women found it funny as well, but the four in the middle are more interested in taking a good picture of themselves! Stereotypes were and always will be funny. 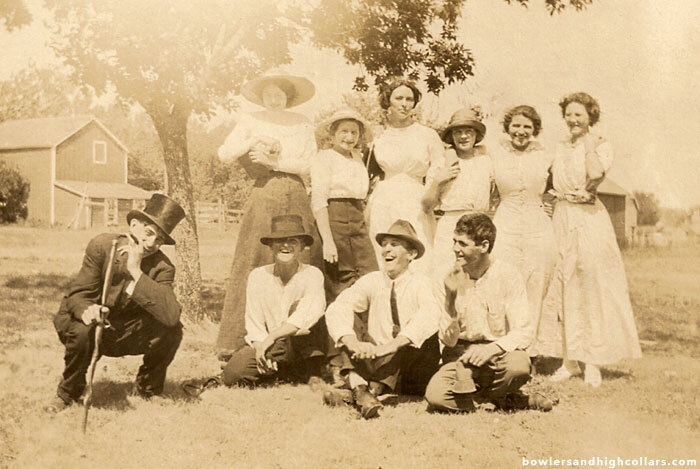 This group seems to have had quite a good time on a sunny summer day. This picture was taken in Nebraska sometime in the 1910s. This entry was posted on Friday, June 12th, 2015 at 5:59 am	and tagged with 1910s, Funny, laughing, Nebraska, smiling, top hat, USA and posted in Groups, Humorous, RPPCs. You can follow any responses to this entry through the RSS 2.0 feed.